Most people have heard of yoghurt, but kefir, also made by fermenting milk, is less well known and just as tasty and benefitial for our health. The origins of kefir are shrouded in mystery, we may never know where it came from, but if you can get hold of some kefir grains for yourself and look after them, you will always have kefir, which has endless uses. Kefir grains are a mixture of yeasts and bacteria that form a solid mass, they are not actually "grains" in terms of seeds, they are just a squishy translucent blob that grows in the milk. The composition of kefir grains varies naturally from one batch to another, but all contain a mixture of lactic-acid bacteria and various yeasts. To make kefir (or kefirred milk), the grains are placed in a container of fresh milk and allowed to stand at room temperature for at least a day, if not several days, the grains are then strained out and used to make more kefir. Kefir tastes sour, slightly cheesy and is a little effervescent. I don’t like the taste by itself, but it adds a delicious sourness to my daily banana smoothie. The taste and texture of the kefir you make will depend on the ratio of grains to milk and the temperature of the room. In hot weather, a very strong brew will quickly form as the microbes consume the sugars in the milk. Kefir has similar health benefits to yoghurt as it populates your gut with beneficial microbes. For me the real advantages of brewing kefir is having a constant source of microbes for starting fermentations, whereas yoghurt is only one or two bacteria, kefir contains a wide variety. I use kefir when I make bread, sauerkraut and fermented pickles, and fizzy drinks, and any other fermentation that needs whey. I also use a little kefir in water to soak rice or quinoa for several hours before cooking. The microbes in the kefir help to pre-digest some of the proteins and carbohydrates in the food so that the nutrients are more available when I eat the food, as well as providing another dose of beneficial microbes for your gut. Kefir is very easy to care for, I was worried that I would somehow kill my grains, but so far I have kept them alive for nearly three years. The key is to find a routine that will suit you and your kefir. At the moment we change the milk in our kefir every week, but some people will change it every day. I separate the kefir grains from the kefir by pouring the contents of the jar through a sieve and into a jug (even though metal sieves are not recommended, I have used one without any problems). If the milk it has formed into curds and whey (this happens when you produce a particularly sour kefir, and can be avoided by having more milk for the amount of grains or keeping it at a lower temperature or for less time), I press the thicker curds through the sieve and the result is a thicker kefir (or you could drain it through cheese-cloth and make kefir cheese, like cream cheese). If the mixture hasn’t split, its very quick to just pour the kefir through the sieve. I rinse out the jar and put the grains back in the jar and top up with fresh milk (I don’t see any need to sterilize anything in this process as the beneficial microbes inhibit the growth of pathogens). I then pour the kefir into bottles and keep them in the fridge. Sometimes I leave the jar with milk and kefir grains on the kitchen bench for a few days and then place it in the fridge, to make stronger kefir. If the weather is very hot, it stays in the fridge, if its cold, the jars can stay on the bench all week, this also depends if we want thick or thin kefir. If we are going to be away and won’t be able to refresh the kefir, it can last in the fridge for several weeks, particularly if there is extra milk for the amount of grains. We currently make two 750 mL jars of kefir each week, and this is enough to last the two of us. We always make our kefir with fresh raw cow’s milk, but it can also be made with goat’s milk or sheep’s milk. I know people who use pasteurised milk (shop milk) and other people who make up milk from milk powder. 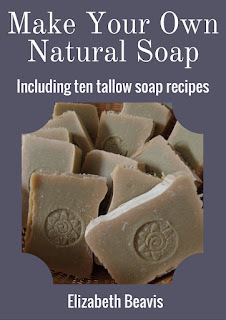 Coconut milk can also be used. Another variation of kefir is “water kefir”, the same grains can be used to ferment juices based on water instead of milk. I haven’t investigated this process, but I’ve heard that it produces a pleasant sour fizzy drink. In warmer weather, the grains multiple quickly and you can give away the excess. I find this is a good form of insurance in case anything ever happens to your kefir, you should know someone who can give you back some kefir grains. This also means that if you need kefir to get started, all you need to do is find someone else who has kefir and wait for them to have excess grains to share with you. You can also buy them online from various sources. It can seem strange at first to have milk going sour on your kitchen bench, but once you get used to it, kefir can be a lot of fun and very useful. Do you ferment kefir? Any tips for beginners? 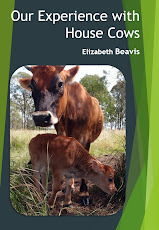 Buy my ebook "Our Experience with House Cows" on Scribd, Lulu and Amazon, or email on eight.acres.liz at gmail.com to arrange delivery. i haven't used anything fermented, let alone made any. have thought about it but i've never been a fan of most ferments, sauerkraut especially as it was around when i was growing up. Fermented foods are having a real revival - seems like you have been on top of this well before the trend. Kefir is wonderful stuff, so versatile. Keep some in the freezer in a ziploc bag with some fresh milk. Thaw in the fridge, refresh the milk and away you go. That's the simplest backup and it works every time. That's a good idea Elaine, thanks for sharing!